The New Jersey Shore stretches for more than 140 miles along the Atlantic Ocean, so it's no surprise that the area is bursting at the seams with excellent camping opportunities for people of all ages and interests. The area offers something for everyone; options range from family-friendly New Jersey campgrounds with swimming pools and busy activity calendars to rugged state parks dotted with lakes and rivers that boast excellent fishing and boating. Whether you're interested in visiting the beaches, the boardwalks, or the peaceful pine forests, here are the best campgrounds to be found on the New Jersey Shore. Only 15 minutes away from the beaches of Long Beach Island, Atlantic City North Family Campground offers large campsites with either full hookups or only water and electrical hookups. There are plenty of on-site amenities for guests to enjoy, including a swimming pool, a mini-golf course, a games room, and a basketball court. The campground hosts theme nights every weekend in the summer, and complimentary Long Island Beach passes are provided during beach season. Cabins and lodges with air conditioning and heat are available for rent, and all guests are given access to restroom facilities with free hot showers. Encompassing more than 23,000 acres in Ocean County, the Bass River State Forest was one of the first New Jersey forests to be set aside for public recreation. The park offers plenty of things to do, but the most popular are fishing in the river, canoeing on the park's beautiful manmade lake, and strolling along the eight walking trails found in the park. 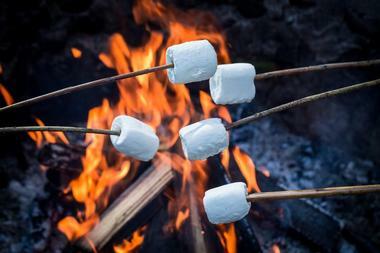 There are 176 campsites for visitors to choose from, all of which are located within walking distance of restrooms and showers, but other accommodation options include cabins, lean-tos, and lakeside shelters equipped with cozy fireplaces. Family owned and operated since 1975, Beachcomber Camping Resort is located on a beautiful 100-acre forested property with two lakes and six pools for guests to enjoy. Both tent and trailer sites are available, but the campground also offers trailers, teepees, and cabins for rent. Special on-site activities are offered every day during the summer months, and theme nights are hosted almost every weekend during spring and fall. Catch and release fishing is permitted in both lakes, and there are plenty of fun facilities for guests to use as well, including volleyball and basketball courts, pool tables, and an arcade. 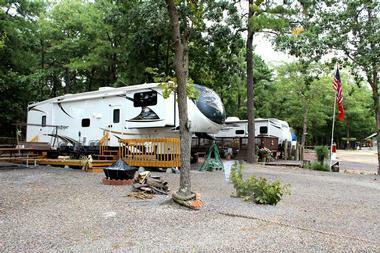 Conveniently located in Cape May, Big Timber Lake RV Camping Resort is a modern campground with plenty of amenities for children and adults alike. The on-site lake is perfect for fishing, kayaking, and swimming, but there is also a large pool for campers who prefer to splash around in a more contained environment. Kayaks are available for rent, and the property also boasts a mini golf course and a high ropes course with a zipline over the lake. Modern conveniences include complimentary Wi-Fi, computer access, and a TV lounge, and guests are also welcome to use the fitness center and laundry facilities. 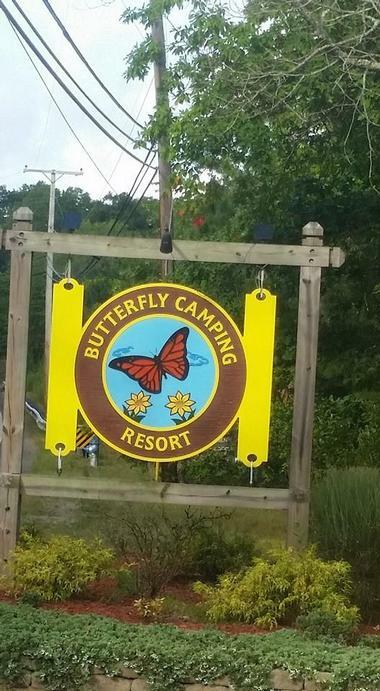 Known for its friendly hospitality and large, shady campsites, Butterfly Camping Resort can be found only a few minutes away from Six Flags Great Adventure Theme Park and Safari. The sites are all equipped with picnic tables, fire pits, water, and electric hookups, and some come with sewer hookups as well. There are plenty of communal amenities as well, including a swimming pool, a mini-golf course, a children's playground, and a beach volleyball court. All campers are provided with complimentary Wi-Fi and cable TV, and the campground is also proud to sell discounted admission tickets to the nearby Six Flags park. 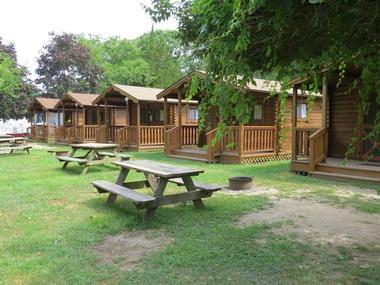 One of more than a dozen Adventure Bound camping resorts, Cape May Campground is located on a beautiful property only a short drive away from some of the best beaches and boardwalks in New Jersey. 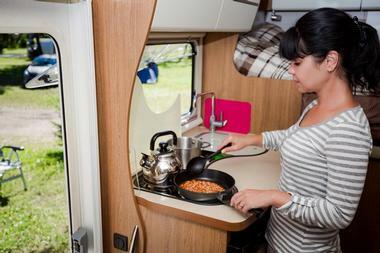 In addition to campsites, the campground offers RV rentals and two types of camping cabin that can accommodate between 4 and 6 people; the deluxe cabins have kitchens and bathrooms, while the rustic cabins do not. All guests are welcome to use the campground's bathhouses, and other amenities include a children’s playground, a swimming pool, and an exciting fun zone with a water slide. Situated right next to the Wadding River, Chips Folly Family Campground offers more than 300 large, shady sites suitable for both tents and RVs. Sites are available on both a seasonal and nightly basis, and there are also several air-conditioned log cabins that can be rented by anyone looking for a bit more luxury. 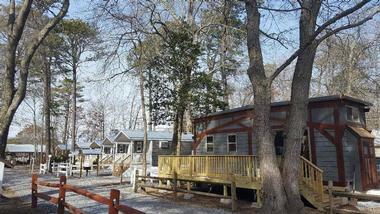 The campground offers a pool and a boat launch, and campers are welcome to fish in the river. A small general store can be found on the property, and a wide selection of excellent restaurants can be found within easy driving distance. Offering beautiful wooded campsites, Frontier Campground is set on a secluded 50-acre property only 10 minutes away from the beach. Both rustic sites with no hookups and RV sites with full hookups are available; all sites have picnic tables and fire rings, and tents and RVs can be rented if needed. The campground also features two unique tree house campsites, which are equipped with beds, half-bathrooms, and indoor kitchens. The bathhouses boast free hot showers, and Wi-Fi is available throughout the property. The campground is open between mid-May and mid-October, and special discounted rates and packages are offered during the off-season. 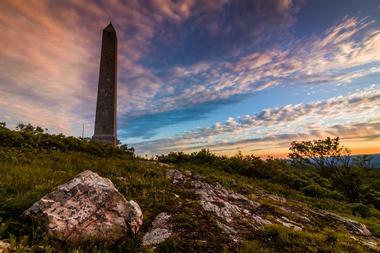 Sitting in northwest New Jersey not far from the New York border, High Point State Park encompasses more than 15,000 acres of forest, farmland, and rolling hills. Campers can spend the night at one of the 50 rustic campsites found on the edge of Sawmill Lake; only tents can be accommodated, but there are also two furnished cabins on the shore of Steenykill Lake if you'd like to spend the night in more comfort. All sites are equipped with picnic tables and fire pits, and there are flush toilets within easy walking distance of every site. Occupying almost 40 acres of forested property only a few miles away from the beautiful beaches of Cape May, Holly Shores Camping Resort has been proudly family owned and operated since 1968. In addition to approximately 300 large campsites, the resort rents out deluxe cabins, tiny houses, and glamping tents. Exciting activities are held every day during the summer; popular options include ceramics workshops, fun theme weekends, and live music played right next to the beautiful pool. Bikes, kayaks, and golf carts are available for rent, and guests are welcome to use the playground, pool, hot tub, and games room. 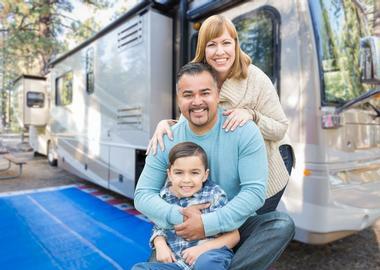 Designed specifically for people who love to go camping in their RVs, Lake & Shore RV Resort is conveniently located only 5 miles away from the New Jersey Shore and is a great destination for the whole family. 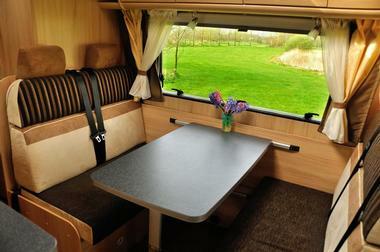 Visitors can also rent cozy furnished cottages, most of which come with either a loft or a deck. Guests of the resort are permitted to fish on the beach, and there are regular potlucks and other scheduled activities to enjoy as well. Wi-Fi and cable are available for a small fee, and campers are welcome to use the pool, clubhouse, playground, and laundry facilities. Long Beach RV Resort & Campground offers easy access to the New Jersey Shore as well as plenty of fun on-site activities and convenient amenities. Kids will love the playground and the jump pillow, while guests of all ages will appreciate the pool, the nature trails, and the mini-golf course. All of the sites are equipped with fire rings and picnic tables, and the RV sites come with full hookups as well. If you're looking for something different from the typical camping experience, you can choose to rent a yurt or one of the resort's one or two-room cabins. Tucked in between Ocean City and Sea Isle City, Ocean Isle Campground is a family-friendly campground that boasts some of the most affordable seasonal rates in the area. Pets are welcome at the campground provided their vaccinations are up-to-date, and on-site amenities include a pool, an arcade, basketball hoops, and pool and air hockey tables. Plenty of activities are held on a regular basis; campers can expect to enjoy pot luck dinners, movie nights, wine and paint nights, and water Pilates classes. 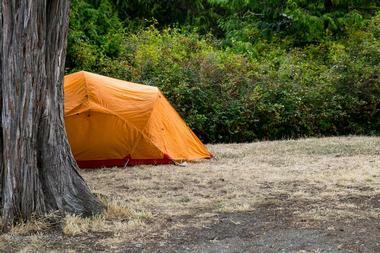 The campsites typically fill up well in advance of the summer season, so reservations are recommended. Set on a beautiful 180-acre property, Ocean View Resort Campground is the biggest privately owned campground in the state. 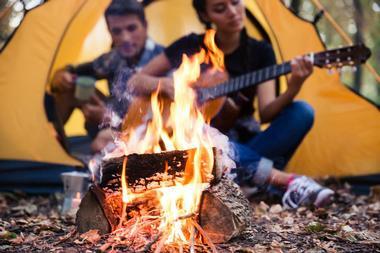 There are almost 1,200 campsites to choose from, all of which are equipped with fire pits, picnic tables, cable television, and full hookups. The campground hosts fun activities on a regular basis, and guests are welcome to make use on the on-site fishing pond, mini-golf course, swimming pool, basketball and tennis courts, and arcades. Paddleboats are available for rent, and a pirate-themed water play area is open during the summer for the younger members of your family. Nestled right near the Pine Barrens in the southwest of New Jersey, Parvin State Park encompasses both peaceful pine forests and beautiful hardwood swampland. In addition to the 56 rustic campsites equipped with fire rings and picnic tables, the park offers 18 furnished cabins and four group campsites that can accommodate up to 25 people each. 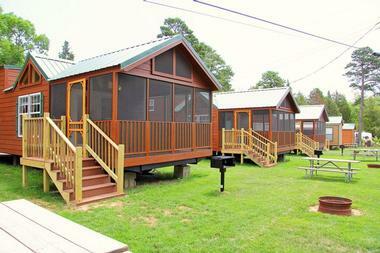 The cabins have running water, and guests of the campsite have access to showers and flush toilets. Overnight stays are only permitted between the beginning of April and the end of October, but there are several picnic areas scattered throughout the park that visitors can enjoy year round. 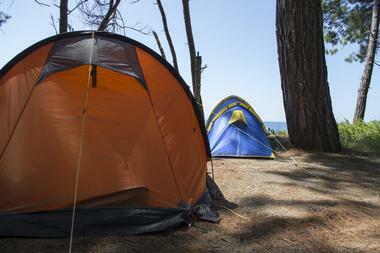 Open year round, Pine Cone Resort offers 125 large campsites with full hookups. 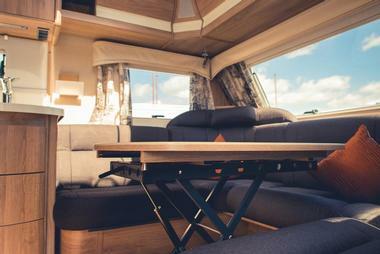 The sites can accommodate both tents and trailers, but there are also several deluxe cabins available for guests who don't want to bring their own camping gear. The sites are typically rented out by the day or by the week, but there are also special seasonal and monthly rates for visitors who want to spend as much time here as possible. Wi-Fi and hot showers are provided free of charge, and guests are welcome to use the soccer field and basketball, volleyball, and tennis courts. Surrounded by magnificent pine and oak forests, Pine Haven Camping Resort is a modern campground with both campsites and comfortable furnished cabins for rent. The campground is only a few miles away from the ocean, and guests are encouraged to take advantage of the two freshwater lakes found on the property, one of which is meant for swimming and the other for fishing. Planned activities like outdoor movies and craft workshops are held on a regular basis. Golf carts and tricycles are available for rent, and the campground's Wi-Fi and laundry facilities can be used for a small fee. Proudly family owned and operated, Ponderosa Campground is the closest campground to beautiful Avalon Beach. It's also conveniently located near many of the area's most popular attractions, including the Wildwood Boardwalk and the Cape May Park & Zoo. The 20-acre property comes with the choice of either RV campsites or cabins, but all guests have access to hot showers, laundry facilities, and a large saltwater swimming pool. The campground is also proud to be pet-friendly; pets are even permitted everywhere on the property besides the pool area, and they're even welcome to stay in the cabins. One of the only parks in New Jersey that permits wilderness camping, Round Valley Reservoir is an excellent destination for anyone interested in fishing, hiking, hunting, and scuba diving. There are 85 peaceful wilderness campsites that can only be accessed by boat or by foot; vehicles and trailers are not permitted. 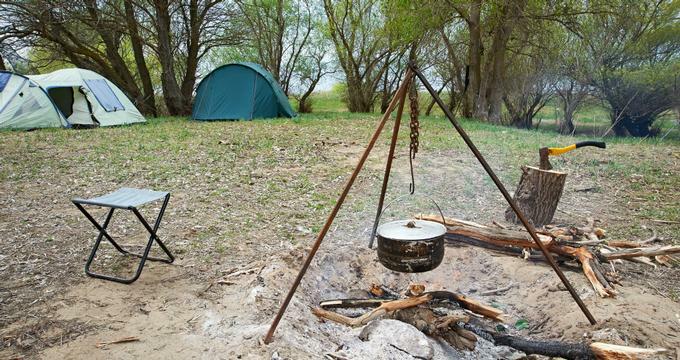 All sites are equipped with a fire ring, and pit toilets and drinking water can be found within easy walking distance. The campsites are open between the beginning of April and the end of October, and campers are required to check in no later than 4 p.m. 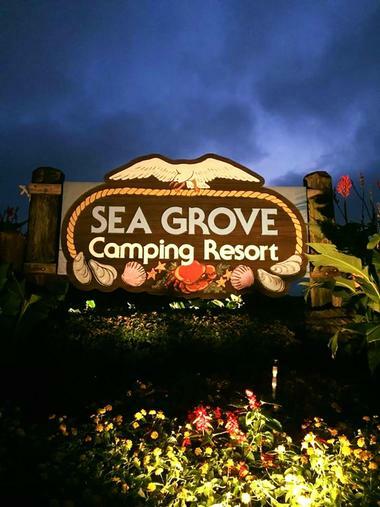 Featuring an inviting, family-friendly atmosphere, Sea Grove Camping Resort is only minutes away from some of the state's best beaches and boardwalks. 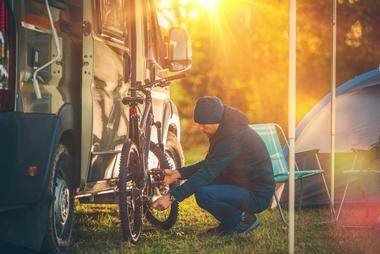 Both rustic tent sites and RV sites with full or partial hookups are available, and sites can be rented by the day, by the week, or by the season. The resort also rents out trailers and cabins for visitors who don't bring their own tents or RVs. Guests are more than welcome to join the exciting scheduled activities that take place most weekends; highlights include carnival and casino nights, bingo socials, and hot dog cookouts. Established in 1970, Sea Pirate Campground offers more than 350 acres of land with approximately 250 campsites and 35 cabins and cottages for rent. Long Beach Island is conveniently located only a few minutes' drive away, and guests are more than welcome to make use of the campground's beautiful swimming pool. A full schedule of fun activities is offered during the high season, with popular options including hayrides, movie nights, and family-friendly arts and crafts sessions. 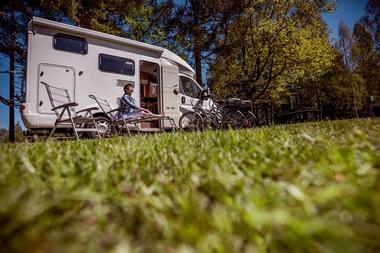 Golf carts and bicycles are offered for rent, and pets are welcome in the campground for a small daily fee. Offering an excellent selection of seasonal sites, Shore Birds Camp Ground prides itself on its peaceful, family-friendly atmosphere. 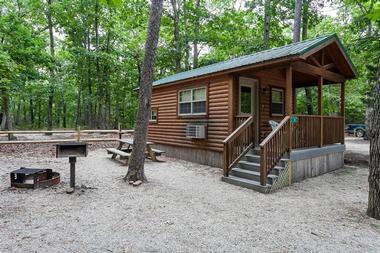 The serene woods surrounding the campground offer plenty of lovely walking trails, and other amenities include a swimming pool, a dog park, a basketball court, and a well-stocked fishing pond. Hot showers are available free of charge, and electricity and cable TV are included in the seasonal rate. 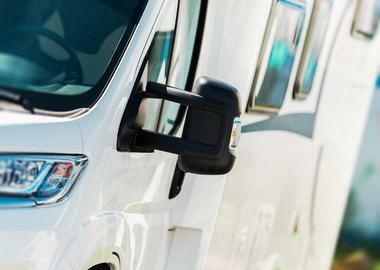 The season runs between the beginning of May and the first week of October, and the campground is happy to store your RV during the winter for no extra charge. 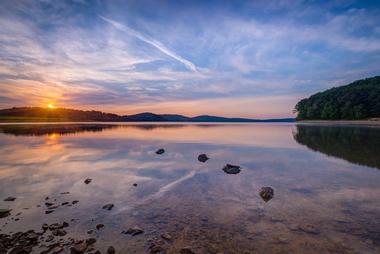 Spruce Run Recreation Area encompasses almost 13,000 acres of land, and it boasts plenty of opportunities to swim, hike, fish, and boat. The park offers almost 70 campsites equipped with fire pits and picnic tables; both tents and trailers can be accommodated, and toilets and showers can be found within walking distance of every campsite. 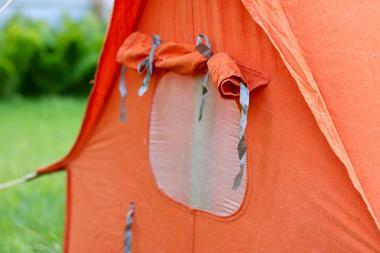 There are also three cozy shelters equipped with wood stoves and beds, which can accommodate up to four people each. The park is open all throughout the year, but overnight stays are only permitted between April 1st and October 31st. Stretching for more than 7 miles along the beautiful Kittatinny Ridge, Worthington State Forest offers roughly 6,600 acres of forested land perfect for hiking and relaxing. 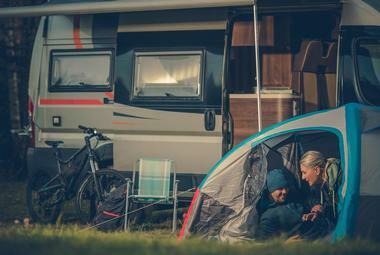 There are more than 80 campsites to choose from, most of which can accommodate both tents and trailers. There are also three group sites that can hold groups of up to 35 people, and all campers have access to picnic tables, showers, and clean restrooms with flush toilets. The campsites are open between the beginning of April and the end of December, and interpretive programming is offered between April and October.